Building and end table is a good way to get started in the DIY world. A DIY end table or side table isn’t a daunting task and can be quite rewarding and with success on a small project, other more complicated DIY project await, if you are interested in finding out more about DIY you might want to check out somewhere like https://howtohome.com/. Here are some DIY side tables to get you going with links and instructions on how to create and build each one. Build this DIY end table here. Learn how to build this end table at Domestic Imperfection. Step by step directions for the ruler end table at Country Living. DIY end table built from books at Whimsically Homemade. Make this French theme side table at Honey Bear Lane. Build this industrial work or art with help from The Golden Sycamore. 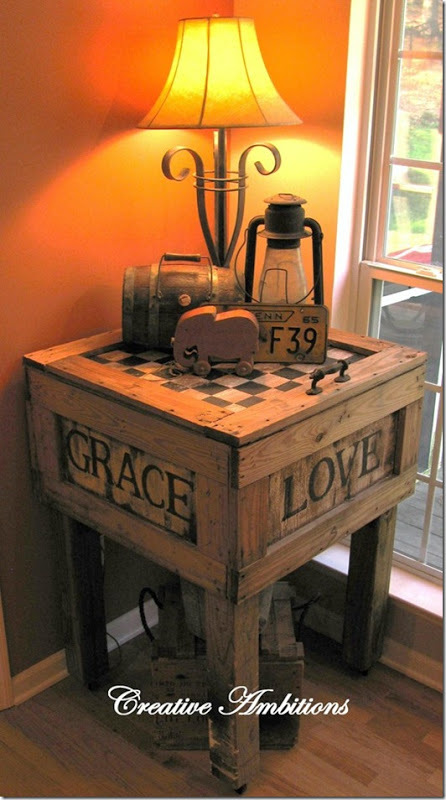 Thanks to Vintage Prairie Style for this lovely end table. Suitcase end table design from Mrs Adventure.